Scottish independence (Scots: Scots unthirldom; Scottish Gaelic: Neo-eisimeileachd na h-Alba) is the political movement for Scotland to become a sovereign state independent from the United Kingdom. In 2014, a national referendum was held in Scotland. Voters were asked: "Should Scotland be an independent country?" 45 percent of voters answered "Yes" and 55 percent answered "No" with a turnout of 85 percent. Scotland emerged as an independent polity during the Early Middle Ages, with some historians dating its foundation from the reign of Kenneth MacAlpin in 843. [note 1] The level of independence of the Scottish kingdom was fought over by the Scottish kings and by the Norman and Angevin rulers of England who petitioned the Pope and other foreign rulers. A popular myth in English folklore was that Britain had been founded by Brutus of Troy, who had left England to his eldest son, Locrinus, and Scotland to his youngest son, Albanactus. Scots disputed this and established their own popular myth, which was that Scotland had been founded earlier, by a Greek prince Goídel Glas and his wife Scota, daughter of the Pharaoh. According to legend, Scota carried the Stone of Destiny from Egypt to Scotland. A watershed in the Scottish kingdom's history was a succession crisis that erupted in 1290 where Edward I of England claimed the right of succession to the Scottish throne. The Auld Alliance of Scotland and France against English interests was first invoked at this time and remained active through to the 1500s. The Wars of Scottish Independence ended in a renewed kingdom under Robert the Bruce (crowned 1306), whose grandson Robert II of Scotland was the first Scottish king of the House of Stuart. From 1603, Scotland and England shared the same monarch in a personal union when James VI of Scotland was declared King of England and Ireland in what was known as the Union of the Crowns. After James VII of Scotland (II of England) was deposed in 1688 amid Catholic-Protestant disputes, and as the line of Protestant Stuarts showed signs of failing (as indeed occurred in 1714), English fears that Scotland would select a different monarch, potentially causing conflict within Great Britain, and the bankruptcy of many Scottish nobles through the Darien scheme led to the formal union of the two kingdoms in 1707, with the Treaty of Union and subsequent Acts of Union, to form the Kingdom of Great Britain. Scottish Jacobite resistance to the union, led by descendants of James VII/II including Bonnie Prince Charlie, continued until 1746. The United Kingdom of Great Britain and Ireland was formed by the Acts of Union 1800, which united the Kingdom of Great Britain and the Kingdom of Ireland. The 26 southern counties of Ireland left the Union in 1922, which became known as the United Kingdom of Great Britain and Northern Ireland. The "Home Rule" movement for a Scottish Assembly was first taken up in 1853 by the National Association for the Vindication of Scottish Rights, a body close to the Conservative Party. A key element in this movement was the comparison with Ireland. The original movement broadened its political appeal and soon began to receive Liberal Party backing. [not in citation given] In 1885, the post of Secretary for Scotland and the Scottish Office were re-established to promote Scotland's interests and express its concerns to the British Parliament. In 1886, however, William Ewart Gladstone introduced the Irish Home Rule Bill. When many Scots compared what they had to the Irish offer of Home Rule, the status quo was considered inadequate. It was not regarded as an immediate constitutional priority however, particularly when the Irish Home Rule Bill was defeated in the House of Commons. Immediately before the First World War, the Liberal Government led by H. H. Asquith supported the concept of "Home Rule all round", whereby Scottish home rule would follow the Irish home rule proposed in the Government of Ireland Act 1914. Asquith believed that there was an iniquity in that the component parts of the United Kingdom could come together to act together in common purposes, but those components could not deal with internal matters that did not require consent across the UK. This was not a nationalist philosophy, but instead Asquith was acting in the belief that federalism was the "true basis of union" and that centralising power in Westminster was the "worst of all political blunders". A Scottish Home Rule bill was first presented to parliament in 1913, but its progress was soon ended as Parliament focused on emergency measures necessitated by the First World War. Unlike Ireland, which rebelled in the Easter Rising and fought a War of Independence, Scotland did not resist central rule. There was, however, a persistent demand for Scottish home rule. The Scottish Office was relocated to St Andrew's House in Edinburgh during the 1930s. The Scottish Covenant was a petition to the UK government asking for home rule. It was first proposed in 1930 by John MacCormick and formally written in 1949. The petition "was eventually signed by two million people" (the population of Scotland was 5.1 million in the census of 1951). The covenant was ignored by the main political parties. Also in 1950, the Stone of Destiny was removed from Westminster Abbey by nationalists. The question of full independence, or the less controversial home rule, did not re-enter the political mainstream until 1960, after the famous Wind of Change speech by UK Prime Minister Harold Macmillan. This speech marked the start of a rapid decolonisation in Africa and the end of the British Empire. The UK had already suffered the international humiliation of the 1956 Suez Crisis, which showed that it was no longer the superpower it had been before World War II. For many in Scotland, this served to undermine one of the principal raisons d'être for the United Kingdom and also symbolised the end of popular imperialism and the Imperial unity that had united the then-prominent Scottish Unionist Party. The Unionist Party subsequently suffered a steady decline in support. The Scottish National Party (SNP) won a Parliamentary seat in 1967, when Winnie Ewing was the unexpected winner of the Hamilton by-election, 1967. This brought the SNP to national prominence, leading to Edward Heath's 1968 Declaration of Perth and the establishment of the Kilbrandon Commission. The discovery of North Sea oil off the east coast of Scotland in 1970 further invigorated the debate over Scottish independence. The SNP organised a hugely successful campaign entitled "It's Scotland's oil", emphasising how the discovery of oil could benefit Scotland's then struggling deindustrialising economy and its populace. In the February 1974 general election seven SNP MPs were returned. The Labour Party did not secure an overall majority, and returned to the polls in October 1974, when the SNP performed even better than they had done earlier in the year, winning 11 MPs and obtaining over 30% of the total vote in Scotland. In January 1974, the Conservative government had commissioned the McCrone report, written by Professor Gavin McCrone, a leading government economist, to report on the viability of an independent Scotland. He concluded that oil would have given an independent Scotland one of the strongest currencies in Europe. The report went on to say that officials advised government ministers on how to take "the wind out of the SNP sails". Handed over to the incoming Labour administration and classified as secret because of Labour fears over the surge in Scottish National Party popularity, the document came to light only in 2005, when the SNP obtained the report under the Freedom of Information Act 2000. The Labour Party under Harold Wilson won the October 1974 election by a very narrow majority of only three seats. Following their election to Parliament, the SNP MPs pressed for the creation of a Scottish Assembly: a viewpoint which was given added credibility by the conclusions of the Kilbrandon Commission. However, opponents demanded that a referendum be held on the issue. Although the Labour Party and the Scottish National Party both officially supported devolution, support was split in both parties. Labour was divided between those who favoured devolution and those who wanted to maintain a full central Westminster government. In the SNP, there was division between those who saw devolution as a stepping stone to independence and those who feared it might detract from that ultimate goal. The resignation of Harold Wilson in 1976 brought James Callaghan to power, but his small majority was eroded by several by-election losses, and the government became increasingly unpopular. Deals were made with the SNP and Plaid Cymru to hold referenda on devolution in exchange for their support, helping to prolong the government's life. The result of the referendum in Scotland was a narrow majority in favour of devolution (52% to 48%), but a condition of the referendum was that 40% of the total electorate should vote in favour in order to make it valid. 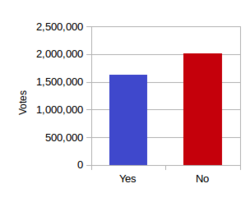 But the turnout was only of 63.6%, so only 32.9% of the electorate voted "Yes". The Scotland Act 1978 was consequently repealed in March 1979 by a vote of 301–206 in Parliament. In the wake of the referendum the supporters of the bill conducted a protest campaign under the slogan "Scotland said yes". They argued that the 40% rule was undemocratic and that the referendum results justified the establishment of the assembly. Campaigners for a "No" vote countered that voters had been told before the referendum that failing to vote was as good as a "No". It was therefore incorrect to conclude that the relatively low turnout was entirely due to voter apathy. In protest, the SNP withdrew their support from the government. A motion of no confidence was then tabled by the Conservatives and supported by the SNP, the Liberals and Ulster Unionists. It passed by one vote on 28 March 1979, forcing the May 1979 general election, which was won by the Conservatives led by Margaret Thatcher. Prime Minister Callaghan described the decision of the SNP to bring down the Labour government as "turkeys voting for Christmas". The SNP group was reduced from 11 MPs to 2 in the 1979 general election, while devolution was opposed by the Conservative governments led by Thatcher and John Major. In the years of the Conservative government after 1979, the Campaign for a Scottish Assembly was established, eventually publishing the Claim of Right 1989. This then led to the Scottish Constitutional Convention. The convention promoted consensus on devolution on a cross-party basis, though the Conservative Party refused to co-operate and the Scottish National Party withdrew from the discussions when it became clear that the convention was unwilling to discuss Scottish independence as a constitutional option. Arguments against devolution and the Scottish Parliament, levelled mainly by the Conservative Party, were that the Parliament would create a "slippery slope" to Scottish independence and provide the pro-independence Scottish National Party with a route to government. John Major, the Conservative prime minister before May 1997, campaigned during the 1997 general election on the slogan "72 hours to save the union". The Labour Party won the 1997 general election and Donald Dewar as Secretary of State for Scotland agreed to the proposals for a Scottish Parliament. A referendum was held in September and 74.3% of those who voted approved the devolution plan (44.87% of the electorate). The Parliament of the United Kingdom subsequently approved the Scotland Act 1998 which created an elected Scottish Parliament with control over most domestic policy. In May 1999, Scotland held its first election for a devolved parliament and in July the Scottish Parliament held session for the first time since the previous parliament had been adjourned in 1707. The Labour Party's Donald Dewar became the First Minister of Scotland, while the Scottish National Party became the main opposition party. With the approval of all parties, the egalitarian song "A Man's A Man for A' That", by Robert Burns, was performed at the opening ceremony of the Scottish Parliament. 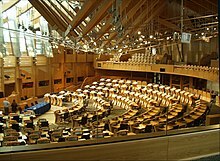 The Scottish Parliament is a unicameral legislature comprising 129 Members, 73 of whom represent individual constituencies and are elected on a first past the post system; 56 are elected in eight different electoral regions by the additional member system, serving for a four-year period. The Queen appoints one Member of the Scottish Parliament, on the nomination of the Parliament, to be First Minister with the convention being that the leader of the party with the largest number of seats is appointed First Minister although any member who can command the confidence of the chamber could conceivably be appointed First Minister. All other Ministers are appointed and dismissed by the First Minister and together they make up the Scottish Government, the executive arm of government. The Scottish Parliament has legislative authority for all non-reserved matters relating to Scotland, and has a limited power to vary income tax, nicknamed the Tartan Tax, a power it did not exercise and which was later replaced by wider tax-varying powers. The Scottish Parliament can refer devolved matters back to Westminster to be considered as part of United Kingdom-wide legislation by passing a Legislative Consent Motion if United Kingdom-wide legislation is considered to be more appropriate for certain issues. The programmes of legislation enacted by the Scottish Parliament since 1999 have seen a divergence in the provision of public services compared to the rest of the United Kingdom. For instance, the costs of a university education, and care services for the elderly are free at point of use in Scotland, while fees are paid in the rest of the UK. Scotland was the first country in the UK to ban smoking in enclosed public places. Survey of the importance of holding a referendum, carried out by the BBC in April 2011. In its manifesto for the 2007 Scottish Parliament election, the Scottish National Party (SNP) pledged to hold an independence referendum by 2010. After winning the election, the SNP-controlled Scottish Government published a white paper entitled "Choosing Scotland's Future", which outlined options for the future of Scotland, including independence. Scottish Labour, the Scottish Conservatives and Scottish Liberal Democrats opposed a referendum offering independence as an option. Then Prime Minister Gordon Brown also publicly attacked the independence option. The three main parties opposed to independence instead formed a Commission on Scottish Devolution, chaired by Kenneth Calman. This reviewed devolution and considered all constitutional options apart from independence. In August 2009, the Scottish Government announced that the Referendum (Scotland) Bill, 2010, which would detail the question and conduct of a possible referendum on the issue of independence, would be part of its legislative programme for 2009–10. The Bill was not expected to be passed, because of the SNP's status as a minority government and the opposition of all other major parties in Parliament. In September 2010, the Scottish Government announced that no referendum would occur before the 2011 elections. The SNP won an overall majority in the Scottish Parliament in its 2011 election. First Minister Alex Salmond stated his desire to hold a referendum "in the second half of the parliament", which would place it in 2014 or 2015. In January 2012, the UK Government offered to provide the Scottish Parliament with the specific powers to hold a referendum, providing it was "fair, legal and decisive". Negotiations continued between the two governments until October 2012, when the Edinburgh Agreement was reached. The Scottish Independence Referendum (Franchise) Act 2013 was passed by the Scottish Parliament on 27 June 2013 and received Royal Assent on 7 August 2013. On 15 November 2013, the Scottish Government published Scotland's Future, a 670-page white paper laying out the case for independence and the means through which Scotland might become an independent country. After a protracted period of negotiation, a public debate between Salmond and Better Together leader Alistair Darling was arranged. On the morning prior to the televised debate, a joint statement, pledging greater devolved powers to Scotland in the event of a "no" vote, was signed by Prime Minister David Cameron (leader of the Conservative Party), Deputy Prime Minister Nick Clegg (leader of the Liberal Democrats), and Labour Party leader Ed Miliband. The BBC website announced the final result of the referendum at 06:24 on 19 September 2014, whereby the "No" vote prevailed with 55% (2,001,926) of the votes from an overall voter turnout of 84.5%. Chief counting officer Mary Pitcaithly stated: "It is clear that the majority of people voting have voted No to the referendum question." The "Yes" vote received 45% (1,617,989) support—the winning total needed was 1,852,828. Results were compiled from 32 council areas, with Glasgow backing independence—voting 53.5% "Yes" to 46.5% "No" (turnout in the area was 75%)—and Edinburgh voting against independence by 61% to 39% (turnout in the area was 84%). Darling stated in his post-result speech, "The silent have spoken", while Salmond stated, "I accept the verdict of the people, and I call on all of Scotland to follow suit in accepting the democratic verdict". Leading figures supportive of Scottish independence have suggested that following the UK vote to leave the EU while Scotland voted to remain in the EU, a second Scottish independence referendum should be precipitated. During the Brexit vote of 23 June 2016, 62% of Scottish voters voted to remain (38% of voters voted to leave the EU). First Minister of Scotland Nicola Sturgeon said that she was looking at all options to "secure our place in the EU", and that a second referendum was "highly likely". A spokesperson for British Prime Minister Theresa May said that "The prime minister and the government does not believe that there is a mandate for [a second referendum]. There was one only two years ago. There was an extremely high turnout and there was a resounding result in favour of Scotland remaining in the UK". The UK Parliament retains parliamentary sovereignty over the United Kingdom as a whole. This claim was endorsed by Lord Bingham of Cornhill in Jackson v Attorney General who argued that then [in 1911], as now, the Crown in Parliament was unconstrained by any entrenched or codified constitution. It could make or unmake any law it wished" and by the Supreme Court in AXA General Insurance Ltd and others v HM Advocate and others. The Deputy President, Lord Hope of Craighead, stated that "the sovereignty of the Crown in Parliament ... is the bedrock of the British constitution. Sovereignty remains with the United Kingdom Parliament." However, the application of the principle of parliamentary sovereignty to Scotland has been disputed. In MacCormick v The Lord Advocate, the Lord President of the Court of Session, Lord Cooper of Culross stated obiter dicta that "the principle of the unlimited sovereignty of Parliament is a distinctively English principle which has no counterpart in Scottish Constitutional Law." 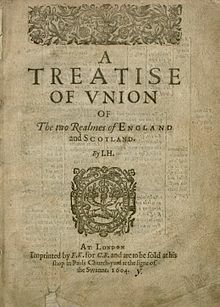 It has been suggested that the doctrine of popular sovereignty, proclaimed in the 1320 Declaration of Arbroath, articulated by Scottish political thinkers like George Buchanan and reasserted by the Claim of Right 1989, is of greater relevance to Scotland. The Claim of Right 1989 was signed by every then-serving Labour and Liberal Democrat MP in Scotland, with the exception of Tam Dalyell. The legality of any British constituent country attaining de facto independence or declaring unilateral independence outside the framework of British constitutional convention is debatable. Under international law, a unilateral declaration might satisfy the principle of the "declarative theory of statehood", but not the "constitutive theory of statehood". Some legal opinion following the Supreme Court of Canada's decision on what steps Quebec would need to take to secede is that Scotland would be unable to unilaterally declare independence under international law if the British government permitted a referendum on an unambiguous question on secession. The SNP have not argued for a unilateral act, but rather claim that a positive vote for independence in a referendum would have "enormous moral and political force... impossible for a future [Westminster] government to ignore", and hence would give the Scottish Government a mandate to negotiate for the passage of an act of the UK Parliament providing for Scotland's secession, in which Westminster renounces its sovereignty over Scotland. Some arguments appeal to rule according to higher law. For example, the United Nations Charter enshrines the right of peoples to self-determination, and the Universal Declaration of Human Rights also guarantees peoples' right to change nationality; the UK is a signatory to both documents. Politicians in both the Scottish and British parliaments have endorsed the right of the Scottish people to self-determination, including former UK Prime Ministers John Major and Margaret Thatcher. As the Scottish independence referendum, 2014 was authorised by an Order in Council, approved by both chambers of Parliament, its constitutional legality was not in doubt. The Edinburgh Agreement (2012) between the Scottish Parliament and the UK Parliament stated that both governments would accept the outcome of the referendum and thereafter would "continue to work together constructively in the light of the outcome, whatever it is, in the best interests of the people of Scotland and of the rest of the United Kingdom". The agreement gave the Scottish Parliament the legal authority to hold an independence referendum before the end of 2014. Scottish independence is supported most prominently by the Scottish National Party, but other parties also support independence. Other pro-independence parties which have held representation in the Scottish Parliament include the Scottish Green Party, the Scottish Socialist Party and Solidarity. At the 2016 Scottish Parliament election, 69 of the 129 seats available were won by pro-independence parties (63 SNP and 6 Greens). The independence movement consists of many factions with varying political views. The SNP wants Scotland to keep the monarchy (see personal union) and become an independent Commonwealth realm, similar to Canada, Australia or New Zealand. All of the other aforementioned pro-independence parties want Scotland to become an independent republic. The SSP has led republican protests and authored the Declaration of Calton Hill, calling for an independent republic. The Independence Convention was set up in 2005, seeking "Firstly, to create a forum for those of all political persuasions and none who support independence; and secondly, to be a national catalyst for Scottish independence." Independence First is a pro-referendum pressure group which has organised public demonstrations. 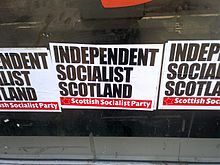 The Scottish Republican Socialist Movement is a Pan-Socialist independence movement that believes that Scotland should be made an independent republic. This movement has a Firebrand socialist ethos, however is not affiliated with the SSP or the Scottish Communist Party. It believes that a failure to become independent should lead to mass emigration elsewhere, or as put as a slogan "Independence or Desertion". Following the launch of Yes Scotland, other campaigns in support of independence were launched, including the National Collective and Radical Independence Campaign. The former is an artist-driven movement which describes itself as "an open and non-party political collaboration of talent focused on driving social and political change in Scotland through a variety of the arts". It is responsible for organising the mock referendum at University of Glasgow which was held in February 2013. The latter proclaims itself to be "fighting for an independent Scotland that is for the millions not the millionaires" and was formed after the Radical Independence Conference 2012 in Glasgow, which was attended by at least 650 people and has been described as a "[bringing together of] the Scottish Greens, the Scottish Socialists, some of the more militant trade unionists, nuclear-disarmament campaigners and anti-monarchist republicans". During the 2014 referendum campaign, independence attracted little support from newspapers. The Sunday Herald was the only publication to endorse a Yes vote in the referendum. The National, a daily newspaper supporting independence, was launched in November 2014. Democracy and national self-determination: Scotland's population will possess full decision-making power in regard to the political affairs of its nation. First Minister Salmond stated in a May 2012 launch that "the people who live in Scotland are best placed to make the decisions that affect Scotland." Nuclear disarmament: with control over defence and foreign policy, an independent Scotland could address the removal of Trident nuclear weapons, an issue long-associated with the campaign for an independent Scotland, as outlined in the House of Commons Defence Committee's white paper "The future of the UK's strategic nuclear deterrent: the White Paper" of 2006-2007. In a July 2013 Huffington Post UK article, the writer suggested that the £25 billion spent on a "like-for-like replacement of the Trident nuclear deterrent" could instead be diverted to education, healthcare and housing. Additionally, the Scottish Campaign for Nuclear Disarmament supports independence on this basis. "It's Scotland's oil": since being used as a highly effective slogan by the SNP in the 1970s, this phrase has encapsulated the argument that only an independent Scotland be able to fully utilise and exploit the financial benefits of its national resources, including North Sea oil and gas, for the benefit of the population. According to the Scottish Government, 64% of the EU's oil reserves exist in Scottish waters, while the David Hume Institute stated: "Scotland is sitting on oil and gas reserves worth up to £4 trillion". Investment in and production from the North Sea oilfields dropped sharply after Tory chancellor George Osborne imposed punitive taxes, undercutting the projected revenue an independent Scotland could claim. Renewable energy: if independence is attained, supporters of the new political structure seek to fully harness Scotland's natural renewable energy resources: 25 per cent of Europe's wind energy potential; 25 per cent of Europe's tidal energy potential; and 10 per cent of Europe's wave energy potential. Salmond claims that this could lead to the "re-industrialisation" of Scotland. A "cultural reawakening": groups like National Collective, a "non-party movement for artists and creatives who support Scottish independence", believe that the opportunities of independence, and the possibilities created, would unleash a fresh wave of cultural ideas, expression and self-confidence in Scotland. "Stop the world, Scotland wants to get on" (a statement by Winnie Ewing, upon her victory for the SNP in the 1967 Hamilton by-election): an independent Scotland would be a full and equal member of the United Nations, NATO and the European Union and many other international organisations. With an autonomous voice in international politics, Scottish independence campaigners believe the nation's global influence would increase in regard to the defence of its national interests and the promotion of its values. It has been claimed that the number of MEPs elected by Scotland would also rise, from six to at least 12. Furthermore, Scottish embassies would be established globally to promote Scotland internationally, and to lobby other governments on the nation's behalf. The Conservative Party, Labour Party and Liberal Democrats, who all have seats in the Scottish Parliament, oppose Scottish independence. In 2012 they established the cross-party Better Together campaign. Other parties that oppose Scottish independence include the UK Independence Party (UKIP), the British National Party (BNP), the National Front (NF), Britain First, the Britannica Party, the Scottish Unionist Party (SUP), the Respect Party and Ulster unionist parties. A campaign group called "Scotland in Union" emerged after the 2014 independence referendum. It has encouraged anti-SNP tactical voting in elections and promoted the Union more generally. However, 'Scotland in Union' has been the subject of controversy, after leaked records indicated that most of their money came from wealthy donors rather than the campaign's own members. In late 2017, a new group called "Unity UK" was formed. Its supporters said that Unionists needed to be more supportive of Brexit and were critical of Scotland in Union's "agnostic" stance on the issue. The Orange Order, a Protestant brotherhood with thousands of members in Scotland, campaigned against Scottish independence, and formed a campaign group called British Together. In September 2014, it held a march of at least 15,000 Orangemen, loyalist bands and supporters from Scotland and across the UK; described as the biggest pro-Union demonstration of the campaign. Many newspapers in Scotland also oppose independence. This includes Scottish-based newspapers The Scotsman, Scotland on Sunday, The Herald, the Sunday Post, the Daily Record, the Sunday Mail, the Scottish Daily Mail, The Scottish Daily Express, The Scottish Sunday Express, and Daily Star of Scotland; as well as UK-wide newspapers The Daily Telegraph, Sunday Telegraph, The Guardian, The Independent, The Economist, Financial Times, The Spectator, and The Sunday Times. There are strong historical and contemporary ties between Scotland and the rest of the UK from the Reformation and Union of Crowns, to Scottish involvement in the growth and development of the British Empire and contribution of the Scottish Enlightenment and Industrial Revolution. Contemporary popular culture is also shared, primarily through the prevalence of the English language. Almost half of the Scottish population have relatives in England. At the time of the 2011 census, approximately 700,000 adults who were born in Scotland lived in the rest of the UK, while about 470,000 adults who were born elsewhere in the UK had moved to live in Scotland. There are also significant economic links with the Scottish military-industrial complex as well as close links within the financial sector. Strong cultural, economic, and family links with the UK. Scotland is economically stronger as a part of the UK economy and better able to prosper in a globalised economy with the international influence and perceived stability derived from being part of a larger state. Scotland's levels of public spending would be difficult to sustain after independence without raising taxes. For example, David Maddox, writing for The Scotsman in 2008, pointed to a future decline in North Sea oil revenue. Some, such as Ruth Davidson of the Scottish Conservatives, wish to reduce public spending and devolve more fiscal powers to the Scottish Parliament in order to address this issue within the broader framework of the Union. Scotland has more influence on international affairs and diplomacy, both politically and militarily, as part of NATO, the G8 and as a permanent member of the UN Security Council. Opponents of further integration of the European Union claim that independence, within Europe but outside the EU three, would mean that Scotland would be more marginalised because, as a relatively small independent country, Scotland would be unable to resist the demands of larger member nations. Uncertainty could be brought in the immediate aftermath of independence, particularly disagreement as to how Scotland would be treated in relation to the European Union, and the unlikelihood of the UK accepting a currency union with an independent Scotland. The chairman of HSBC, Douglas Flint, warned in August 2014 of uncertainty if there was an independent-Scottish currency, or if Scotland joined the Eurozone, which could result in capital flight. Outlying regions such as Orkney, Shetland and the Western Isles will be disadvantaged or deserve a greater share of oil revenue. Many opinion polls were conducted about Scottish independence before the 2014 referendum. Professor John Curtice stated in January 2012 that polling had shown support for independence at between 32% and 38% of the Scottish population. This had fallen somewhat since the SNP were first elected to become the Scottish Government in 2007. The research also showed, however, that the proportion of the population strongly opposed to independence had also declined. Curtice stated in April 2014 that support for independence had increased since December 2013, although there was disagreement between the polling companies as to the true state of public opinion. Polls in the run-up to the referendum vote showed a closing of the gap, with one poll giving the Yes campaign a 51–49 lead. In the referendum Scotland voted against independence by 55.3% to 44.7%, with an overall turnout of 84.5%. Since the referendum, opinion polls have asked how people would vote in a hypothetical second referendum. These polls have been carried out since six weeks after the referendum. Twenty-five opinion polls were conducted in the year after the referendum, with seventeen of them having "No" as the predominant answer, seven having "Yes", and one having an equal proportion of respondents for each opinion. ^ Writing in 1992, Andrew Marr dated the formation of the Kingdom of Scotland at 1034, with the reign of Duncan I. ^ "Inside Information". Herald Scotland. Retrieved 8 September 2014. ^ "Brexit: Scots prefer independence to no-deal, poll finds". Retrieved 12 December 2018. ^ Correspondent, Libby Brooks Scotland (15 November 2018). "Sturgeon: Brexit chaos makes independence case stronger every day". The Guardian. Retrieved 12 December 2018. ^ "Scotland's Referendum 2014 - Background". Retrieved 8 September 2014. ^ a b c "Scottish referendum: Scotland votes 'No' to independence". BBC News. 19 September 2014. Retrieved 19 September 2014. ^ a b "Referendum results: Turnout a record high as Scots vote No to independence". Scotland Now. 19 September 2014. Retrieved 20 September 2014. ^ a b "Scottish Referendums". BBC. Retrieved 11 June 2007. ^ "Scottish Home Rule". Skyminds.net. 6 July 2007. Retrieved 6 April 2009. ^ a b "Devolution's swings and roundabouts". BBC News. BBC. 7 April 1999. Retrieved 7 January 2014. ^ "1951 Census: Preliminary Report |". Vision of Britain. 8 April 1951. Retrieved 18 October 2013. ^ Gilson, Mike (16 January 2007). "Come and join great debate on nation's past, present and future". The Scotsman. Edinburgh. Retrieved 17 October 2015. ^ "Scottish Referendums". BBC. 30 November 1990. Retrieved 6 April 2009. ^ a b c d e "The Devolution Debate This Century". BBC. Retrieved 11 June 2007. ^ Russell, Ben; Kelbie, Paul (10 June 2007). "How black gold was hijacked: North sea oil and the betrayal of Scotland". The Independent. London. Retrieved 17 October 2015. ^ "Regional distribution of seats and percentage vote". psr.keele.ac.uk. Retrieved 21 June 2007. ^ "Papers reveal oil fears over SNP". BBC. 12 September 2005. Retrieved 9 December 2009. ^ "Scottish Economic Planning Department" (PDF). ^ "BBC report on 1979 election". BBC. 3 May 1979. Archived from the original on 15 May 2005. Retrieved 6 April 2009. ^ Hansard, House of Commons, 5th series, vol. 965, col. 471. ^ Martin, Campbell (23 August 2003). "SNP should return to the honest argument on independence". The Scotsman. Edinburgh. Retrieved 17 October 2015. ^ "Breaking the Old Place up". The Economist. 4 November 1999. Retrieved 14 October 2006. ^ "Politics 97". BBC. September 1997. Retrieved 14 October 2006. ^ "Scottish Parliament Factsheet 2003" (PDF). The Electoral Commission. Archived from the original (PDF) on 18 January 2013. Retrieved 16 December 2009. ^ "About Scottish Ministers". Retrieved 8 September 2014. ^ BBC Scotland News Online "Scotland begins pub smoking ban", BBC Scotland News, 2006-03-26. Retrieved 17 July 2006. ^ "At-a-glance: SNP manifesto". BBC News. BBC. 12 April 2007. ^ "SNP Manifesto (PDF)" (PDF). BBC News. Retrieved 19 January 2012. ^ Wintour, Patrick (4 May 2007). "SNP wins historic victory". The Guardian. London. Retrieved 20 June 2007. ^ "SNP outlines independence plans". BBC News. BBC. 14 August 2007. ^ "Scotland's Future: A National Conversation". 14 August 2008. Retrieved 8 September 2014. ^ "UK | Scots split would harm UK – Brown". BBC News. 25 November 2006. Retrieved 6 April 2009. ^ "Commission on Scottish Devolution". Commission on Scottish Devolution. Retrieved 6 April 2009. ^ "Scotland | Devolution body members announced". BBC News. 28 April 2008. Retrieved 6 April 2009. ^ Calman devolution commission revealed Archived 20 July 2008 at the Wayback Machine, The Herald, 28 April 2008. ^ Black, Andrew (11 May 2011). "Scotland's 129 MSPs sworn in after SNP win". BBC News. BBC. Retrieved 26 June 2011. ^ Gardham, Magnus (2 May 2011). "Holyrood election 2011: Alex Salmond: Referendum on Scottish independence by 2015". The Daily Record. Retrieved 3 August 2011. ^ Clegg, David (17 January 2012). "Advocate General says SNP's referendum plans would be 'contrary to the rule of law'". The Courier. DC Thomson. Retrieved 9 January 2014. ^ Clegg, David (11 January 2012). "Independence referendum: Scotland facing constitutional chaos". The Courier. DC Thomson. Retrieved 9 January 2014. ^ "Timeline: Scottish independence referendum". BBC News. BBC. 15 October 2012. Retrieved 15 October 2012. ^ Text of the Scottish Independence Referendum (Franchise) Act 2013 as in force today (including any amendments) within the United Kingdom, from legislation.gov.uk. ^ "Scottish independence: Referendum White Paper unveiled". BBC News. 26 November 2013. Retrieved 5 January 2014. ^ "Scottish independence: STV confirm Darling and Salmond TV debate date". BBC News. BBC. 9 July 2014. Retrieved 9 July 2014. ^ Severin Carrell (5 August 2014). "Scotland promised extra tax and legal powers for referendum no vote". The Guardian. Retrieved 5 August 2014. ^ Griff Witte (19 September 2014). "Scotland votes to remain part of United Kingdom". The Washington Post. Retrieved 19 September 2014. ^ "Scottish independence: Edinburgh rejects independence". BBC News. 19 September 2014. Retrieved 19 September 2014. ^ "Scottish independence: Glasgow votes Yes to independence". BBC News. 19 September 2014. Retrieved 19 September 2014. ^ "Scottish referendum: Scotland votes no to independence". BBC News. 19 September 2014. Retrieved 19 September 2014. ^ "Nicola Sturgeon Denies She Has 'Machiavellian' Wish For Brexit". The Huffington Post UK. 24 January 2016. Retrieved 3 February 2016. ^ "UK votes to leave the EU". BBC News. 24 June 2016. Retrieved 24 June 2016. ^ "The end of the United Kingdom: What Brexit means for the future of Britain". 22 June 2016. Retrieved 23 June 2016. ^ "New Scottish independence bill published". BBC News. 20 October 2016. Retrieved 28 February 2017. ^ Editor, Hamish Macdonell (27 March 2017). "May stands firm against second Scottish referendum". The Times. ^ An introduction to devolution in the UK Archived 10 September 2008 at the Wayback Machine House of Commons Library, Research Paper 03/84, 17 November 2003. ^ "UK Parliament – Parliamentary sovereignty". Parliament.uk. 21 November 2007. Archived from the original on 17 July 2009. Retrieved 6 April 2009. ^ Burrows, Noreen (1999). "Unfinished Business: The Scotland Act 1998". Modern Law Review. 62 (2): 241–260. doi:10.1111/1468-2230.00203. ^ "Yes/Yes – Reverend Kenyon Wright". Scottish referendum. BBC. Retrieved 10 January 2012. ^ MacWhirter, Iain (26 February 2009). "'That Bloody Woman'". New Statesman. Retrieved 10 January 2012. The poll-tax row finally persuaded Labour's ultra-cautious shadow Scottish secretary, Donald Dewar, to join the cross-party Scottish Constitutional Convention in 1988 and sign its "Claim of Right" document, which called for a repatriation of Scottish sovereignty. ^ "Daily Hansard – 27 April 1999". ^ The Moder Law Review Vol. 62, No. 3, May 1999. ^ Naughton, Philippe; Sage, Adam (18 January 2007). "Scotland and the thorny road to independence". The Times. London. Retrieved 6 April 2009. ^ "Your Questions Answered". Scottish Government. 14 August 2008. Retrieved 12 January 2012. ^ "Q&A: Scottish independence referendum". BBC News. BBC. 10 January 2012. Retrieved 12 January 2012. ^ Hazell, Robert. Rites of secession, The Guardian, 29 July 2008. ^ a b "Agreement between the Scottish Government and the United Kingdom Government on the referendum on independence for Scotland". Scottish Government. Retrieved 8 September 2014. ^ Dickie, Mure (27 June 2017). "Sturgeon postpones plans for second Scottish independence referendum". Financial Times. Retrieved 24 September 2017. ^ Martin, Lorna (10 October 2004). "Holyrood survives birth pains". The Guardian. London. Retrieved 21 June 2007. ^ Carrell, Severin (22 June 2012). "The claymore count: the groups fighting for and against Scottish independence". The Guardian. Guardian Media Group. Retrieved 29 March 2015. ^ "Introduction: Aims and Questions". Scottish Independence Convention. Retrieved 4 July 2007. ^ "About Us". Retrieved 13 February 2013. ^ "Scottish independence: Glasgow University students plan ballot". BBC News. 18 January 2013. Retrieved 13 February 2013. ^ "Join the Debate: Glasgow Launches Independence Referendum". 18 January 2013. Retrieved 13 February 2013. ^ "Radicals threaten Salmond and Scottish independence campaign". The Independent. London. 24 November 2012. Retrieved 13 February 2013. ^ a b "The National launches in Scotland 'to fly flag for independence'". The Guardian. 24 November 2014. Retrieved 30 March 2015. ^ "Scottish newspapers divide over referendum vote". HoldTheFrontPage.co.uk. 16 September 2014. ^ "'Scotland's future will be in Scotland's hands'". Herald Scotland. 26 May 2012. Retrieved 13 June 2014. ^ Great Britain: Parliament: House of Commons: Defence Committee (7 March 2007). The future of the UK's strategic nuclear deterrent: the White Paper, ninth report of session 2006-07, Vol. 2: Oral and written evidence. The Stationery Office. pp. 167–. ISBN 978-0-215-03280-5. ^ Chris York. "Trident Nuclear Replacement Will Cost £25 Billion: What Else Could The UK Buy?". Huffington Post UK. AOL (UK) Limited. Retrieved 13 June 2014. ^ "Scots CND backs Yes campaign". Herald Scotland. Herald & Times Group. 19 November 2012. Retrieved 13 June 2014. ^ Hurst Hannum; Eileen Babbitt (2006). Negotiating Self-Determination. Lexington Books. p. 40. ISBN 9780739114339. ^ "What are the benefits of Scotland being independent? - Yes Scotland". Retrieved 8 September 2014. ^ "First Minister: Scotland can be "intellectual powerhouse of green energy"". The Scottish Government. Crown copyright. 8 April 2014. Retrieved 13 June 2014. ^ Martin Kelly (5 May 2013). "Scottish oil revenues massively underestimated according to new report". Newsnet Scotland. Retrieved 13 June 2014. ^ "Who torpedoed independence?". www.economist.com. The Economist. 19 September 2014. Retrieved 19 September 2014. ^ "Energy in Scotland: Get the facts". The Scottish Government. Crown copyright. January 2014. Retrieved 13 June 2014. ^ "'Energy economy to reindustrialise Scotland' - FM". The Scottish Government. Crown copyright. 15 February 2012. Retrieved 13 June 2014. ^ Jamie Mann (19 May 2014). "Jamie Mann: Scotland's Cultural And Political Reawakening Has Come Hand In Hand". National Collective. National Collective. Retrieved 13 June 2014. ^ "About Us". National Collective. National Collective. 19 May 2014. Retrieved 13 June 2014. ^ a b "Scotland's Future". The Scottish Government. Crown Copyright. 26 November 2013. Retrieved 13 June 2014. ^ "Session 2012-13 HC 643 The foreign policy implications of and for a separate Scotland". www.parliament.uk. Parliamentary copyright. 19 September 2012. Retrieved 13 June 2014. ^ "Why does Scotland matter?". British National Party. 27 July 2014. Archived from the original on 26 August 2014. Retrieved 26 August 2014. ^ Beaton, Connor (21 June 2014). "BNP splinter joins anti-indy campaign". The Targe. Retrieved 22 June 2014. ^ a b Cramb, Auslan (2 March 2015). "New pro-Union campaign to identify seats where tactical voting could defeat SNP". Telegraph.co.uk. ^ Johnson, Simon (6 March 2015). "Unionists can hold back the SNP 'if they act together'". Telegraph.co.uk. ^ Gilligan, Andrew (5 March 2015). "Anti-SNP tactical voting: can it hold back the nationalist tide?". Telegraph.co.uk. ^ a b Gordon, Tom (7 December 2017). "Unionist campaign splits over Brexit and second referendum". The Herald. Retrieved 11 January 2018. ^ "Scottish independence: Orange Lodge registers to campaign for a 'No' vote". BBC News. 25 June 2014. Retrieved 8 September 2014. ^ "British Together campaign". Archived from the original on 31 August 2014. Retrieved 8 September 2014. ^ "Orange Order anti-independence march a 'show of pro-union strength'". The Guardian. 13 September 2014. ^ "Orange Order descends on Edinburgh to protest against 'evil enemy' of nationalism ahead of Scottish independence vote". Daily Mail. 14 September 2014. ^ "Orange Order march through Edinburgh to show loyalty to UK". Financial Times. 13 September 2014. ^ "Scotland can be changed for the better with a no vote". Scotland on Sunday. 14 September 2014. Retrieved 14 September 2014. ^ a b Greenslade, Roy. "All eyes on Rupert Murdoch over the Sun's Scottish independence stance". The Guardian. 10 September 2014. ^ Macdonell, Hamish (4 May 2014). "The Sunday Herald says 'yes' to Scottish independence. Which newspaper will be next?". Spectator. The Spectator (1828) Ltd. Retrieved 7 May 2014. ^ "We back NO vote because only together can we build a better future". The Scottish Daily Express. 16 September 2014. p. 14. ^ "Why we must vote to remain in the UK". Scottish Sunday Express. 14 September 2014. Retrieved 14 September 2014. ^ a b Editorial (14 September 2014). "Scottish Referendum - Our future can be great if we face it together". The Telegraph. Retrieved 14 September 2014. ^ Editorial (12 September 2014). "The Guardian view on the Scottish referendum: Britain deserves another chance". The Guardian. Retrieved 12 September 2014. ^ "Scottish independence: Bigger together - both Britain and Scotland would be diminished by Yes vote". The Independent. 17 September 2014. ^ "Don't leave us this way". The Economist. 11 July 2014. Retrieved 11 July 2014. ^ "Scotland's fateful choice". Financial Times. 10 September 2014. ^ "Stay, Scotland - the Spectator reader's message". The Spectator. 11 September 2014. Retrieved 11 September 2014. ^ Severin Carrell (14 September 2014). "Scottish referendum: majority of Sunday newspapers back no vote". the Guardian. ^ "The Union Jocks". Scotland on Sunday. 17 February 2008. Retrieved 25 June 2008. ^ Eardley, Nick (7 August 2014). "Scottish independence: The Scots in England who want Scotland to go it alone". BBC News. Retrieved 8 September 2014. ^ Gray, Louise (27 July 2007). "Doubts raised over future of shipyards under independence". The Scotsman. Edinburgh. Retrieved 20 August 2007. ^ "The Scottish gamble". BBC News. 30 April 2007. Retrieved 20 June 2007. ^ Maddox, David (21 June 2008). "Oil price fuels fresh row on Scots 'deficit'". The Scotsman. Edinburgh. Retrieved 25 June 2008. ^ Carrell, Severin (26 March 2013). "Scottish Tories reverse anti-devolution stance with call for greater powers". The Guardian. London. Retrieved 3 April 2013. ^ Gray, Louise (26 January 2007). "Study finds no benefit in fiscal autonomy as McCrone calls time on Barnett". The Scotsman. Edinburgh. Retrieved 5 January 2016. ^ "'Billions needed' to boost growth". BBC News. 14 March 2006. Retrieved 18 August 2007. ^ "Public/private sectors in economy need to be rebalanced". The Scotsman. Edinburgh. 15 March 2006. Retrieved 5 January 2016. ^ "Scottish Independence – Reality or Illusion?". Global Politician. 5 January 2007. Retrieved 20 June 2007. ^ "The European Union and the United Kingdom Union". Better Together. Archived from the original on 24 October 2013. Retrieved 18 October 2013. ^ "Nationalist plans on currency and tax are falling apart". Better Together. Archived from the original on 24 October 2013. Retrieved 18 October 2013. ^ "Weak Scottish currency will cause capital flight after independence says HSBC boss". Scotland News.Net. 23 August 2014. Retrieved 23 August 2014. ^ Riley-Smith, Ben (18 March 2014). "Shetland and Orkney should get vote on whether to leave Scotland". Daily Telegraph. Retrieved 26 March 2014. ^ Lawless, Jill (23 March 2014). "Scotland's Vikings go own way in independence vote". Associated Press. Retrieved 9 May 2014. ^ "Scottish islanders seek votes for own independence". Reuters. 24 March 2014. Retrieved 26 March 2014. ^ "Island referendum petition launched". Shetland Times. 18 March 2014. Retrieved 26 March 2014. ^ "Petition for independence in the Western Isles, Shetland and Orkney". The Herald. Herald & Times Group. 19 March 2014. Retrieved 26 March 2014. Hassan, Gerry (2011). Radical Scotland: Arguments for Self-Determination. Luath Press. Keating, Michael (2009). The Independence of Scotland: Self-Government and the Shifting Politics of Union. Oxford: Oxford University Press. Keating, Michael (2013). Nationalism, unionism and secession in Scotland. Secessionism and Separatism in Europe and Asia: To have a state of one’s own. Routledge. pp. 127–144. Marr, Andrew (2013). The Battle for Scotland. Penguin Books. ISBN 978-0-241-96793-5. Murkens, Jo Eric (2002). Scottish Independence: A Practical Guide. Edinburgh University Press. ISBN 978-0-7486-1699-2. Pittock, Murray (2008). The Road to Independence? : Scotland Since the Sixties. Reaktion Books.